According to a recent item in The Filipino Reporter,the Archdiocese of New York says that the Chapel of San Lorenzo Ruiz will not close (See my previous post Joseph Zwilling is Mistaken). In apparent contradiction, there is a movement afoot to save it. 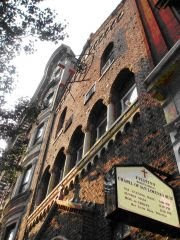 Today, an item in PR Inside Please help Save the Filipino Chapel in New York. The piece presents somewhat different information from the other articles and encourages members of the Filipino community to sign an online petition. The fate of the Chapel of San Lorenzo Ruiz and its community of faith is no different from other churches (including schools) within the Archdiocese of NY.The effort & passion concerning the petition to save it could have been less futile if this kind of action was done three(3) years ago.The original Letter of Appointment(of the former Pastor/Apostolate Director)would be a better read than the 'Decree'. I constantly feel like I am a day late and a dollar short in this effort. As I wrote these posts, I got the idea that these parishes that were allowed to limp along in a state of slighly malign neglect were placeholders, kind of like the parking lots in lower Manhattan that recently gave way to skyscrapers. It is a shame that the Cardinal's Annual Appeal capitalizes on parish loyalty in order to raise money, then implies that there is something amiss with the parishioners when this loyalty is expressed in a different way. Thanks for reading and commenting. Anonymous, if you pass this way again, please refer me to anything that you think will help me "wise up," as they say in the old neighborhood.